Lysophosphatidic acid (LPA), the simplest of all phospholipids, exhibits pleiomorphic functions in multiple cell lineages. The effects of LPA appear to be mediated by binding of LPA to specific members of the endothelial differentiation gene (Edg) family of G protein-coupled receptors (GPCR). Edg 2, Edg4, and Edg7 are high affmity receptors for LPA, and Edgl may be a low affinity receptor for LPA. PSP24 has been shown to be responsive to LPA in Xenopus oocytes, however, its role in mammalian cells is unclear. The specific biochemical events initiated by the different Edg receptors, as well as the biological outcomes of activation of the individual receptors, are only beginning to be determined. LPA levels are consistently elevated in the plasma and ascites of ovarian cancer patients, but not in most other epithelial tumors, with the exception of cervix and endometrium, suggesting that LPA may be of particular importance in the pathophysiology of ovarian cancer. 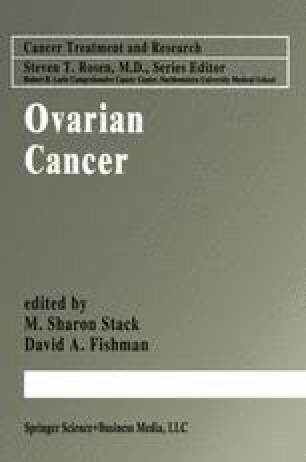 In support of this concept, ovarian cancer cells constitutively and inducibly produce high levels of LPA and demonstrate markedly different responses to LPA than normal ovarian surface epithelium. Edg4 and Edg7 levels are consistently increased in malignant ovarian epithelial cells contributing to the aberrant response of ovarian cancer cells to LPA. Edg2 may represent a negative regulatory LPA receptor inducing apoptosis in ovarian cancer cells. Thus, increased levels of LPA, altered receptor expression and altered responses to LPA may contribute to the initiation, progression or outcome of ovarian cancer. Over 40% of known drugs target GPCR, making LPA receptors attractive targets for molecular therapeutics. Indeed, using the structure-function relationship of LPA in model systems, we have identified selective Edg2 antagonists, as well as Edg4 and Edg7 agonists. These lead compounds are being assessed in preclinical model systems. Understanding the mechanisms regulating LPA production, metabolism and function could lead to improved methods for early detection and to new targets for therapy in ovarian cancer.